General Description: It is a perennial, rhizomatous plant with stems which originate from a crown just below the soil surface. The plants begin growing in early spring before their competitors. Stems, roots and leaves exude a milky sap that can be an irritant to skin. Flower Description: Clusters of small, greenish flowers at the tips of branches made up of many male flowers and one female flower. 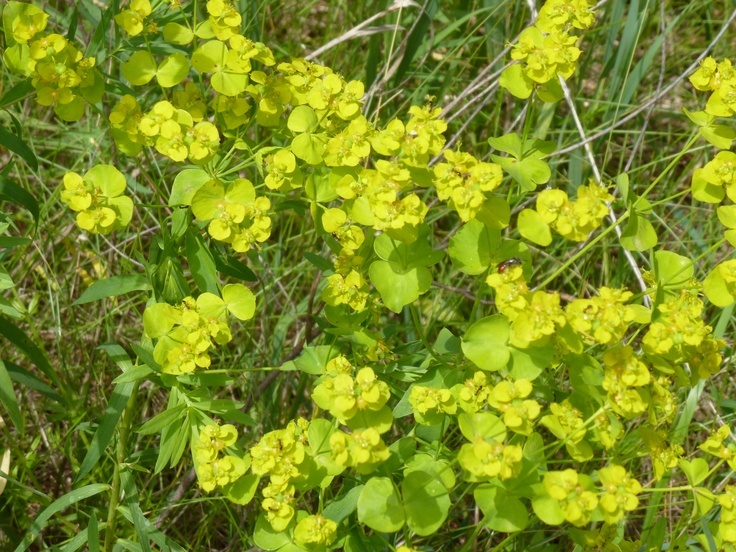 Yellow bracts occur at the base of flower cluster, may appear to be petals from a distance. Leaf Description: Leaves are alternate, narrow and about 3 inches long with lowest leaves much reduced. Leaves have smooth margins and may have a whitish coating. Leaves by flowers are broad, heart-shaped and yellow-green, turning red in the fall after the first frost. Stem Description: Upright stems are 1.5 to 3 feet tall, branching near the top. Fruit/Seed Description: Capsule with seeds inside fairly smooth and dividing into 3, 1-seeded pieces.